Instantly removes chlorine and chloramine. Protects fish and assists in healing of fish wounds. Stress Coat completely neutralizes and removes chlorine, chloramine & the ammonia associated with chloramine, which is added to tap water. Chloramine is toxic to fish as it is a molecule of chlorine and ammonia. Many water conditioners mainly break the bond, releasing the toxic associated ammonia. 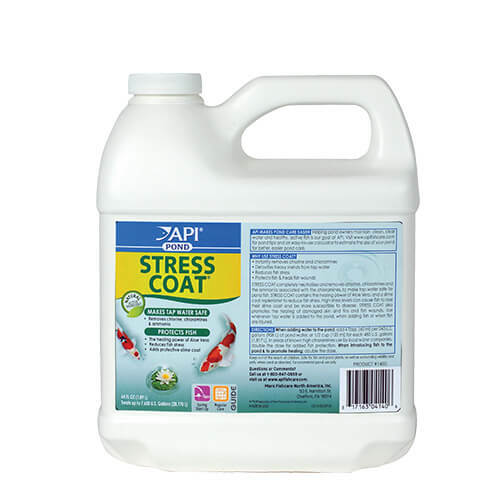 API Pond Stress Coat Plus+ special formula containing a slime coat replenisher and Aloe Vera, not only eases stress but also promotes the healing of damaged fish tissue and detoxifies heavy metals from tap water. Recommended for use whenever adding new water or new fish to a pond. To Remove & Neutralize Chlorine & Chloramines Use whenever tap water is added to the pond. Add 40ml per 160 gallons of pond water. For larger ponds, add 1/2 cup for each 480 gallons of pond water to remove chlorine and chloramine. In areas where water supply companies use high concentrations of chloramine, the dose should be doubled for added protection to your fish. To Protect Fish Add 40ml per 80 gallons of pond water to protect fish. For larger ponds, use 1/2 cup for each 240 gallons to protect fish. Dose daily for 7 days. Treatment may be continued if necessary.